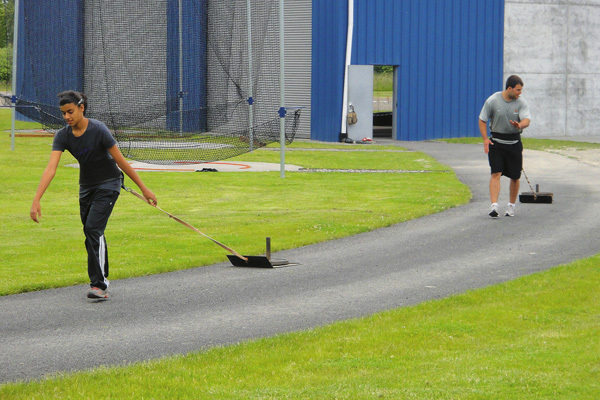 Last summer, Anushi Desai spent 20 days at a training camp for discus throwers in Portland, Oregon. Now the 15-year-old is looking forward to the next edition of the South Asian Games, where she will represent India in the event. No, one summer camp did not transform Anushi into a world-beater. But the camp honed her technique, improved her performance and focussed her athletic energies: She had attended a skiing camp in Zermatt in Switzerland in 2008 (which she enjoyed immensely), and also plays handball, football and track events. However, when she began excelling at the discus, winning at the state and national levels in 2010, her mother Malini trawled the internet and shortlisted two training camps in the US. After zeroing in on Portland’s Throwers’ Academy, run by Olympian Mac Wilkins, the family scheduled their summer holiday around the camp. “The training was fun, with different exercises every day,” says Anushi. What was especially beneficial was Coach Wilkins’ decision to videotape Anushi’s action, which helped her perfect her turn-and-throw technique. In December that year, at the Maharashtra Schools Sports Meet, Anushi would go on to break the record for discus throw, improving her own performance by as much as 15-20 percent. Training with another Olympic winner-turned-coach, the Romanian Adrian Ginju, worked fabulously for 10-year-old Toshi Mahrotri as well. While planning to visit New York, the Mahrotris investigated summer programmes that would add some structure to the holidays for their two young children. “We really lucked out with the swimming, especially for Toshi. After years of struggle in the pool, especially with freestyle, the camp offered her a breakthrough. She started enjoying swimming, her style and technique improved,” says dad Tarun Mahrotri. The New York experience was so good that international camps have now become an annual ritual for the family, which spends some time each year talking to friends in different places and researching online for the best sporting options for their kids. This summer, the Mahrotris have decided to holiday in London, while younger son Kabir enrols for a week-long soccer camp at the Bobby Charlton Soccer and Sports Academy in Manchester. As part of the camp, D’Souza’s young wards participate in tournaments like the Catalonia Trophy, a league for under-nines to under-19s in Costa Brava, near Barcelona. “The players compete on well-kept real grass and 3G grass pitches before progressing to the knockout stages. Besides exposing kids to international players and styles, such tournaments and friendlies with Spanish teams give the kids a chance to know where they stand competitively. This is the reason I like parents to come along, so that they too get a chance to see the details of the training and acquire an idea of their children’s potential,” says D’Souza. The majority of the sign-ups for the Liverpool and Barcelona summer camps conducted by the Premier India Football Academy, however, travel on their own. The 15-odd boys, in the age group 10-18, are escorted by Anjali and Nirvan Shah, the husband-wife team that runs PIFA’s coaching classes in Mumbai, Bangalore and other cities. Besides food (including vegetarian options) and accommodation, the summer package includes a stadium and museum visit—Camp Nou, home to FC Barcelona, in Spain, and Old Trafford (Manchester United) and Anfield (Liverpool FC) in the UK—a tour of the city and a trip to an amusement park. 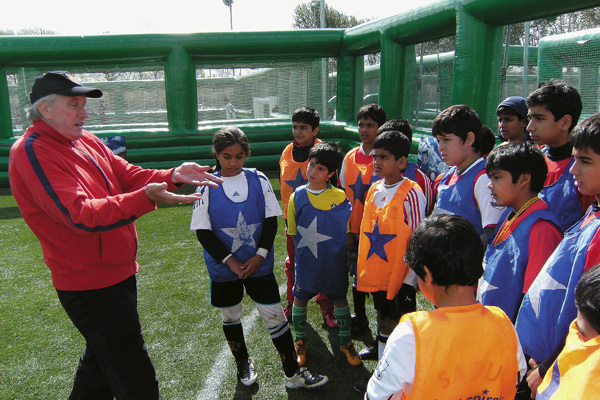 The training itself is conducted by FA-licensed coaches. For many parents, though, it is the chance to pack in a sports camp with a family holiday that is the dealmaker. It helps, of course, that some of the world’s greatest cities also have deep associations with sports and coaching facilities: New York, London, Liverpool and almost all of Spain. Sporting traditions here are strong and facilities like playing fields and tracks and parks are fabulous. There’s a culture of coaching, and of children playing. They’re often interesting matches to attend. And the weather helps as well. For Sanjeev and Alyona Kapoor, this mix is what transformed an athletics training programme for their daughter Kriti into a memorable holiday for the whole family. Likewise, for Suchita and Rakesh Damani, a three-week basketball training stint for son Neel in the small town of Bellingham in Washington state, doubled up as a great family holiday. A class X student, Neel had represented Cathedral and John Connon School (Mumbai) in basketball, but didn’t enjoy the coaching very much. “A friend suggested he train for the summer in the US. She referred me to a basketball coach, a college student who worked with players in his spare time in the college she worked in,” says Suchita. Nothing beats intensive research when it comes to pinpointing a coaching camp for your child. Each of these outfits has a different focus, while your child, too, may have a definite need. 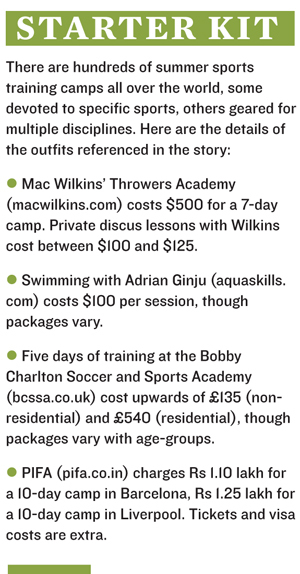 Some camps—like Wilkins’s, for instance—are more specialised than others. PIFA’s summer programmes, on the other hand, are built around the experience-plus-exposure model. For the kids, though, it’s always fun, with the bonus of bettering their games. “My basketball game has improved. I didn’t have much stamina earlier. Playing in different terrains, in different cultural conditions works well for young athletes. Added to that the serendipitous thrill of meeting stars—one PIFA group met Brazilian footballer Kaka in Milan, Italy—visiting legendary stadiums, making friends from various countries and cultures and, most of all, realising that sports can be taken seriously, taught methodically and yet be fun. While it may be wishful thinking to see a potential world champion in every child who is gifted a summer training stint abroad, a week or 10 days spent honing an interest can often have an indelible impact on a young life. And it isn’t a bad way to spend a summer holiday either.